British Psychological Society members call for support in defending the pensions of university staff; Society representatives respond. As chartered members of the British Psychological Society (BPS), we are asking that our professional body use its position of influence with Universities UK (UUK) in support of BPS members who are engaged in industrial action being coordinated by the University and College Union (UCU) to defend the pensions of university staff. There are hundreds of chartered academic and practitioner psychologists who teach on BPS accredited degrees and postgraduate courses in the UUK group of universities, many of whom are facing unprecedented financial hardship in retirement under UUK’s proposed changes to the USS pension scheme. The reductions in benefits are of such a magnitude that they are very likely to affect the future retention and recruitment of psychologist teaching and support staff. The claim by UUK and USS that the pension fund is in real terms deficit is disingenuous and has been shown to be false, arrived at using worst-case scenario models that are not fit for purpose. Comparable professional representative bodies, the British Medical Association and the British Dental Association have already published statements of support for the strike, and for their clinical academic members who work as researchers and trainers in universities. We and our colleagues help to train the next generation of psychologists. We do this because we love our subject, and want to pass on our knowledge and experience of psychology to new generations of students. We are supported in this by PhD students, researchers, librarians, and support and administrative staff, all of whom play crucial roles in running BPS accredited courses and administering BPS accredited degrees, who will also be impoverished if UUK is successful in its attempts to change the way the pension scheme operates for university staff. There is a very real risk that in the future, psychologists and other staff will not be able to afford to work for universities on BPS accredited psychology courses if these pension changes are enforced by UUK. We call on the BPS to support unequivocally its chartered and non-chartered members, including psychology undergraduate and postgraduate students who will be adversely affected if accredited psychology degrees cannot be adequately staffed due to the current attempt by UUK to drastically reduce our retirement benefits. British Psychological Society response: We share your concerns over the potential hardship ahead both on a personal level and for the discipline of psychology. Many of our members' pensions are at risk. 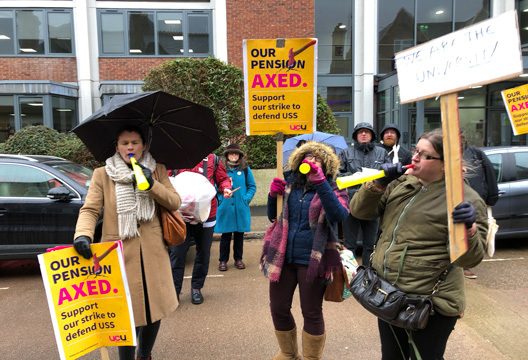 And there are clearly wider issues at stake: the strike could be seen as the culmination of growing frustrations over the state of Higher Education in general. The first point to make is an essential one: the Society is not a trade union. In that sense we are not a ‘comparable representative professional body’. Charity Commission guidance, while it encourages political activity to advance our aims, prevents us from actively lobbying on party political or trades union issues. However, in the past, members have rightly called the Society out for using this fact as an excuse for inaction. There are ways we can support our members in the changing climate of Higher Education. The Society has changed, and with the support of our professional staff – for example the education and communications teams who are leading this HE response – we are continuing to work on ways we can do more, say more, achieve more. The impact of regulatory changes on the Higher Education sector is to be a priority for our newly formed Education and Training Board. The Society will be centrally involved in discussions over the impact of possible differential fees on Psychology; the impact on Psychology of different fee regimes in devolved administrations; the implications of subject level TEF; the role Psychology has in advancing the issue of mental health in education and particularly in HE (for students and staff); issues of equality and diversity, including our ‘male’ deficit at undergraduate level, and providing support for Athena SWAN. Academic psychologists continue to value our robust accreditation standards and the support these give for the protection of resources. The Research Board also continues actively to push for a REF that enables the fair and appropriate assessment of Psychology, and to highlight the risks of fragmentation as a result of the assessment. The Board is also looking at increasing the visibility of the Society’s current offer for early career researchers, recognising the need for unified support across the organisation. In these ways, we will continue to work in partnership with our academic colleagues in the Association of Heads of Psychology Departments and the Experimental Psychology Society (through the Joint Committee for Psychology in Higher Education) to present a coherent and inclusive position. The Society is also making real headway in terms of a positive and sustained policy impact in Parliament. This is where we believe our energies are best expended. In this arena, we will be clearly emphasising the importance of ensuring the education and training of the next generation of psychologists – a workforce who are desperately needed to fulfil the government's ambitions around the nation's wellbeing and prosperity. We want to hear more from our members about how these issues are affecting psychologists and psychology. We can amplify your voices in order to shape the debate over the future of Higher Education. We’re stronger together. We can and will support you, through our actions to secure the future of education, training and practice in psychology.